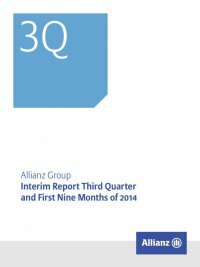 Interim Report Third Quarter and First Nine Months of 2014 Allianz Group42 Assets and liabilities of the Asset Management BUSINESS segment Asset Management assets The Asset Management business segment’s results are derived pri- marily from third-party asset management. In this section, we refer only to the business segment’s own assets.1 The business segment’s asset base decreased from € 4.5 bn to € 2.9 bn – mainly from debt securities as a result of the allocation of certain entities to other reportable segments. Cash and cash pool assets are now the remaining main component of the business seg- ment’s asset base. Asset Management liabilities Liabilities in our Asset Management business segment decreased from € 4.0 bn as of year-end to € 2.6 bn, primarily due to the above- mentioned allocation. 1 For further information on the development of these third-party assets, please refer to the Asset Manage- ment chapter. Effective 1 January 2014, the ­Allianz Group allocated certain entities from the reportable segment Asset Management to the reportable segments German Speaking Countries, Western & Southern Europe and Growth Markets within the business segment Life/Health and to the reportable segment Banking. Assets and liabilities of the Corporate and Other BUSINESS segment Corporate and Other assets The Corporate and Other asset base increased by € 4.1 bn to € 45.4 bn. This was due to an increased volume of debt securities and, to a lesser extent, equities. Composition of asset base – fair values € bn as of 30 September 2014 as of 31 December 2013 Financial assets and liabilities carried at fair value through income Equities 0.1 – Debt securities 0.1 – Other1 (0.5) (0.2) Subtotal (0.2) (0.2) Investments2 Equities 2.5 1.7 Debt securities 29.6 26.4 Cash and cash pool assets3 (4.6) (5.0) Other 0.3 0.3 Subtotal 27.7 23.4 Loans and advances to banks and customers 17.9 18.2 Corporate and Other asset base 45.4 41.3 1 This comprises assets of € 0.1 bn and € 0.3 bn and liabilities of € (0.6) bnand € (0.5) bn as of 30 September 2014 and 31 December 2013, respectively. 2 These do not include affiliates of € 77.1 bn and € 75.4 bn as of 30 September 2014 and 31 December 2013, respectively. 3 Including cash and cash equivalents, as stated in our business segment balance sheet, of € 1.5 bn and € 1.5 bn and receivables from cash pooling amounting to € 1.9 bn and € 0.7 bn, net of liabilities from ­securities lending and derivatives of € (0.0) bn and € (0.2) bn, as well as liabilities from cash pooling of € (8.0) bn and € (7.1) bn as of 30 September 2014 and 31 December 2013, respectively. Our exposure to ABS investments increased by € 0.8 bn to € 1.7 bn. This was due to new investments, representing an increase from 2.2 % to 3.8 % of the Corporate and Other’s asset base. Corporate and Other liabilities Compared to year-end, other liabilities increased by € 2.3 bn to € 25.9 bn. This was largely related to pension obligations. Subordi- nated liabilities increased by € 0.5 bn to € 12.0 bn as of 30 September 2014 as the redemption of a € 1.5 bn perpetual bond was more than offset by the issuance of two undated subordinated bonds with a vol- ume of CHF 500 mn and € 1.5 bn in the first and third quarter of 2014, respectively. Certificated liabilities were down by € 0.4 bnto € 12.8 bn.2 2 For further information on ­Allianz SE debt as of 30 September 2014, please refer to notes 18 and 19 to the condensed consolidated interim financial statements.